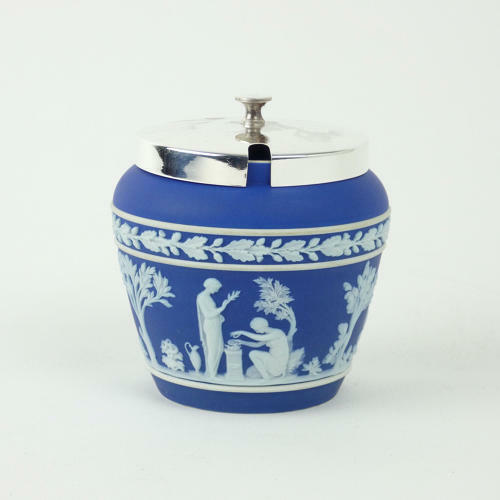 A Wedgwood, dark blue jasper dip preserve pot with a silver plated lid. Although this piece is unmarked it is a Wedgwood shape and design, and quality. It has simply missed the marking process. This was something which rarely happened with Wedgwood and it dates from c.1860. It is decorated with a very attractive band of classical figures beneath a border of oak leaves and acorns. The reliefs are all good quality, the jasper dip is a good, rich shade of blue and the piece is in excellent condition.